First, a slight apology. I realise that, as I post the photo above, I’ve stumbled into the trap of using a boring cliché. That line up is everywhere. That all aside, look at that beer! It comes from Keelham Farm Shop as part of their £22 Yorkshire Beer Experience box, a box that’s finished with a couple of bags of Piper’s excellent crisps, and another couple of bags of superb pork scratchings. They bill it as a pub crawl in a box, and that just about nails it. Now, Yorkshire has something of a reputation for producing good beer. These parts have been a major centre for brewing for many centuries. This whole ‘craft beer revolution’ thing is nothing new around here. 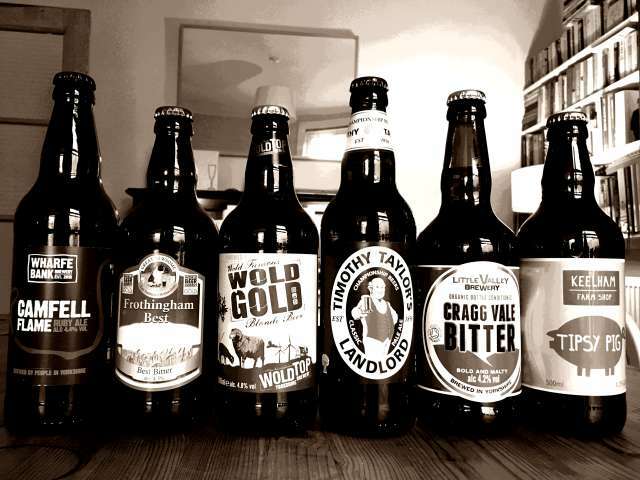 Keelham have selected a good range of bottles, with beer from Little Valley in Hebden Bridge, Wharfe Bank Brewery in Otley, Great Newsome near Hull, and Timothy Taylor’s and Naylor’s from Keighley. It’s a fairly safe but solid mix – these beers are generally well-known big-hitters – but it’s a selection that neatly shows off the strength of Yorkshire’s brewing industry. If you want to know more about the richness and diversity of Yorkshire beer, I can thoroughly recommend Leigh Linley’s books Great Yorkshire Beer and Great Yorkshire Bottled Beer. My one incredibly pedantic and minor gripe is that Piper’s, the crisp people, are based in Brigg, which is in Lincolnshire, but almost within sight of Hull, so their crisps, magnificent as they are, seem a little out-of-place next to half a dozen Yorkshire beers and a couple of bags of pork scratchings from somewhere in Bradford. I think I can live with that, though. This ‘Taste Box’ is one a range that Keelham have introduced to showcase the diverse range of independent producers they stock. Other boxes centre around things like Yorkshire tea, cheese, chilli, champagne … that sort of thing, and range in price from £15 up to about £110. For more information, have a look at keelhamfarmshop.co.uk. Full disclosure: Keelham Farm sent me this box for the purposes of this review. I’m not going to turn down a box of beer and crisps. That’d be wrong. Sound review! Hey! Even if they were gratis, it’s not like a box of Yorkshire beer and crisps is going to get a bad review. Keelham Farm Shop’s own Tipsy Pig is a smashing brew and it’s good to see it alongside those other excellent beers.